If you want to take a nice little bike ride in the heart of Portland, hit some highlights with the Steel Bridge - Hawthorne Bridge loop. Because it follows the banks of the Willamette, you can’t get lost, which is kind of nice if you are new to town. The loop also includes Portland landmarks, such as the floating section of the Eastbank Esplanade. 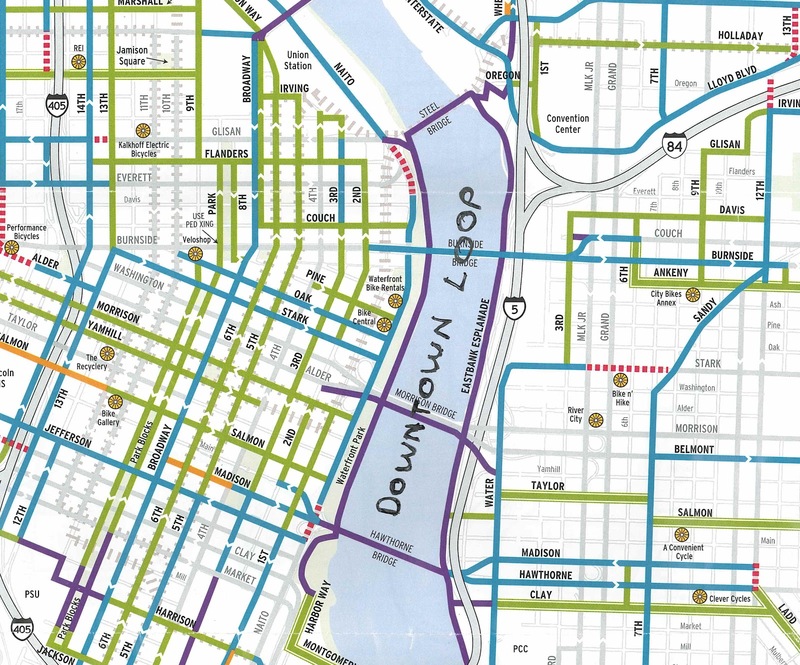 Of course, you can always figure out how to best extend the loop with the city’s Portland by Bicycle map. The downtown loop is also a great place to park your bike, relax, and watch a stream of Portlanders bike past. Portland’s chief bike blogger and publisher of bikeportland.org, Jonathan Maus, recently photographed a variety of people biking through Waterfront Park on a warm spring day. He added this colorful photo session to his People on Bikes collection. The construction of the floating section of the Eastbank Esplanade and Steel Bridge’s bike path completed the loop in 2001. Both were major accomplishments for bicycling and walking in Portland and had to overcome numerous regulatory, liability, and engineering challenges. For example, the prefabricated sections of the Steel Bridge’s cantilevered path had to be assembled in less than 48 hours in order to minimize the obstruction of traffic on the river. Morning commuters on Hawthorne Bridge. According to city bike counts, bikes account for 20% of traffic on the bridge. Portland will be getting bike-sharing in 2013. Then there will likely be stations along the loop where you can rent a bike 24/7 for as long as you need it, even if it is just to do the downtown loop. Until then, you can rent from a variety of bike shops. We personally recommend renting WorkCycles bikes from Clever Cycles, which is less than a mile from the Hawthorne Bridge on Hawthorne Ave. I like a longer bike loop around downtown that consists of using the Sellwood bridge, 6 miles South as your crossover. The Springwater corridor is the East side path which is well laid out but the West side route is a little trickier, but much less crowded. Also just South of downtown on the West side is the Tram which goes up to OHSU. For four dollars you can go up it with your bike and then 'bomb' back down. The views from the tram are great!